I noticed something strange when I logged into my MSDYN365 adminstration center today with a tenant administrator. I reset one of my sandbox instances and deployed a new July Update (v9) version, and after it completed the deployment I went in to add the O365 Group solution. 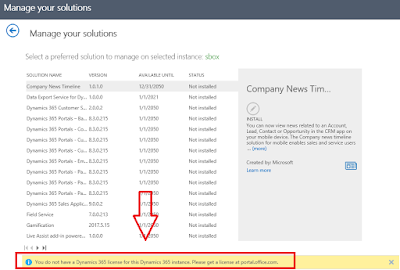 You do not have a Dynamics 365 license for this Dynamics 365 instance. Please get a license at portal.office.com. I thought that this was really weird, because as an administrator you're allowed to create, export and import solutions. You do not have permission to access these records. Contact your Microsoft Dynamics 365 administrator. So I went into one of my v8.2 instances and did the same operations. No issues, able to create, export and import solutions without any errors. Went back in to the admin center and tried to manage solutions for my v8.2 instances. Got the same error message and no option to install new or upgrade existing solutions. Surely this must be a logical slip from Microsoft, so I'm going to try and get in touch with the support team about it. Administering solutions in the MSDYN365 Administration Center requires licensing as well as tenant or service administrator, for all instance versions. 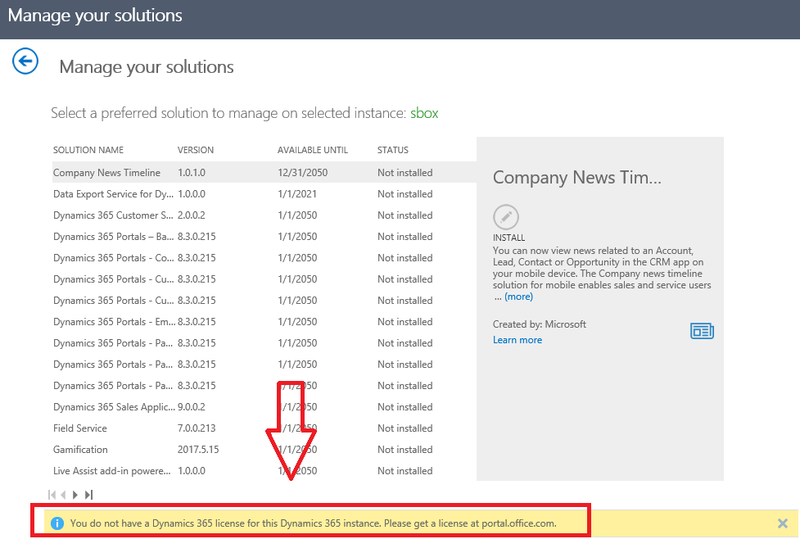 Exporting and importing solutions inside an MSDYN365 instance does not work for v9.0 (but creating and publishing does).